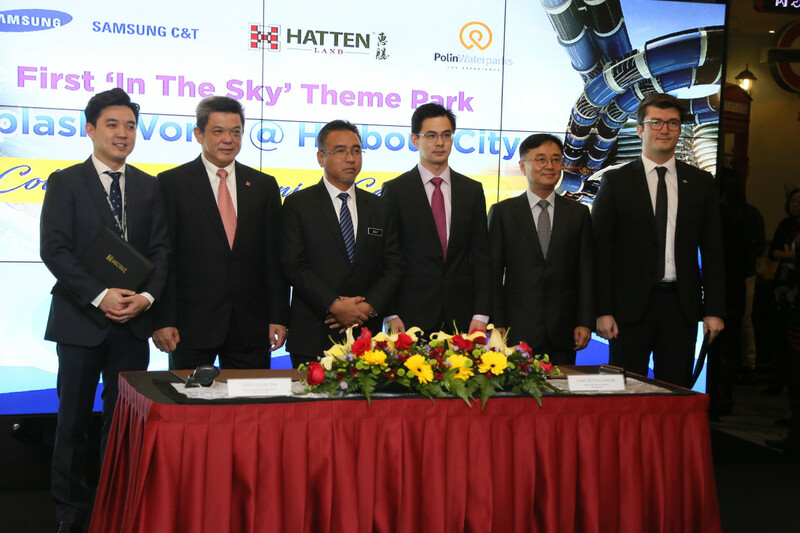 PETALING JAYA (August 7): SGX-listed Hatten Land Ltd will be working with resort operator Samsung C&T Corp and water slides designer and installer Polin Waterparks to build the largest water theme park in Melaka – Splash World @ Harbour City. According to a press release by the developer today, Splash World @ Harbour City is a 500,000-sq ft water park situated on the 14th floor deck of Harbour City @ Melaka, a mixed development with an estimated GDV of RM2.2 billion. Hatten Land managing director and executive chairman Datuk Colin Tan added that the water theme park is a very important project which underscores the company’s commitment to the long-term development of the state. “We are partnering world-renowned leaders in their respective fields – Samsung C&T Corporation and Polin Waterparks – to place Melaka on the world map as a must-visit destination. We are grateful to the government of Melaka and the Malaysian authorities for their support of this project,” he added. With an estimated development cost of RM200 million, the four-storey Splash World @ Harbour City will be the first theme park “in the sky” that offers an indoor and outdoor waterpark experience with more than 1km of water slides. A man-made river will meander over two floors to intertwine more than 50 attractions, including 11 extreme slides for thrill-seekers, a Sky Beach, and a dedicated children’s water play park. After dark, the Cosmic Waters light show will illuminate the park, accompanied by a water circus, trapeze stunts and other entertainment in a special amphitheatre. The water theme park is expected to be completed by end-2019 and open to the public in the first half of 2020. It is able to accommodate up to 5,200 visitors per day and aims to attract 850,000 to 1 million visitors annually after its first year of operations. Hatten Land will develop the project while Polin Waterparks will design and manufacture the water slide attractions and Samsung C&T will be the operation advisor and consultant. Melaka Chief Minister Adly Zahari, who witnessed the signing ceremony among the three parties today, said that Splash World @ Harbour City is expected bring a transformational new dimension to the local travel and leisure landscape and make Melaka an even more compelling international attraction. “The impact of this project will resonate beyond tourism to the broader economy, creating new jobs and opportunities for international economic partnerships and even direct investments,” he said. Samsung C&T executive vice president Tommy Byungsuk Jeong said this marks the company’s first foray into Malaysia. “Riding on our success with the Everland and Caribbean Bay resorts, we are pleased to offer our services and operational expertise in this new venture with Hatten’s Splash World @ Harbour City. We are optimistic about future growth in Melaka’s tourism industry,” said Jeong, who is also the general manager of Everland Resort. Meanwhile, Polin Waterparks regional sales director Emre Büyükgüngör added that the company is honoured to be appointed to design and install Hatten Land’s choice of hybrid ride designs to create a one-of-a-kind experience at Splash World @ Harbour City.